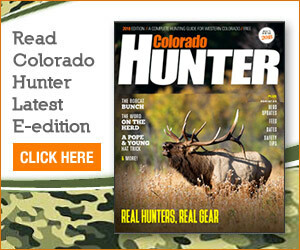 The Colorado Parks and Wildlife Commission during its regular May meeting approved big game hunting license numbers for the upcoming fall hunting seasons, the agency reported in a news release. The agency utilized herd population estimates in recommending reductions in license numbers for mule deer, elk and pronghorn while recommending increases in licenses to manage growing populations of moose and black bears, according to the release. The agency will issue more than 240,000 limited licenses for the state’s ‘big three’ species — elk, deer and pronghorn — it announced in the press release. Wildlife managers and biologists around the state recommended the issuance of 139,461 limited elk licenses, 79,800 limited deer licenses and 23,862 pronghorn licenses for the 2012 fall seasons. Statewide, mule deer licenses declined 5.8 percent from 2011. In addition to issuing nearly 140,000 limited elk licenses, officials plan to issue an unlimited number of over-the-counter bull elk licenses in the archery, 2nd rifle and 3rd rifle seasons. The availability of unlimited licenses helps make Colorado the top destination in the U.S. for elk hunting, according to the release. The 2.2 percent decline in the number of limited elk tags offered this year is mostly related to elk populations reaching management objectives after several years of efforts by the agency to reduce elk damage on private lands. Despite the elk license number reduction, Colorado remains the destination state for elk hunters, offering more elk licenses than any other state, the release stated. Black bear hunting license numbers will increase this season after biologists determined the animal’s population is larger than previously believed. New estimates show that approximately 16,000 to 18,000 black bears live in Colorado, according to the release. “The emergence and increased affordability of things like DNA, tooth cementum analysis and GPS tracking collars have given us new tools to know that Colorado’s current black bear population is robust and larger than previously believed,” agency carnivore biologist Jerry Apker said in the release. Apker also stated in the release that the agency’s black bear knowledge exceeds some other species because every hunter-harvested bear in Colorado is required to be checked by Parks and Wildlife personnel and significant historical harvest information about black bears is maintained by the agency. The historical harvest information coupled with new technology led to the increased population estimate and the increased number of hunting licenses approved for this coming fall, according to the release. Also at the meeting, the Parks and Wildlife Commission voted to deny a petition that would have allowed rock climbing on property at the Rifle Falls Fish Hatchery. Commissioners based the decision on concerns about an active golden eagle nest in the immediate area and concerns regarding diversion of wildlife funds, safety issues, parking problems and potential damage to sensitive hatchery and water equipment in the area, according to the release. The Rifle Falls Fish Hatchery was built in 1955 and was the largest trout hatchery in the world at that time. The hatchery raised about 3.7 million fish last year and is responsible for about 40 percent of the catchable trout in the state hatchery system, the release stated. Commissioners also approved regulations to grant military veterans and active duty members of the military free entrance to all state parks on Veteran’s Day each Nov. 11. The Commission ruling makes permanent the previous tradition of the former Parks Board passing a “free day” for veterans and active duty service members each year, according to the release. “Colorado Parks and Wildlife is honored to be able to support our service members with this action,” assistant director Ken Brink said in the release.